A voracious reader and book collector all his life, Thomas Jefferson owned so many books that in 1814, he donated his personal library to serve as the new Library of Congress. Author’s note. Note about Thomas Jefferson as a slaveholder. Selected bibliography and source notes. Full-color illustrations done in pen and ink and watercolor. Thomas Jefferson loved books, reading, and libraries, and he started accumulating books as a young man. This original and lyrical picture-book biography tells the story of how Jefferson’s vast book collections helped to create the world’s largest library, the Library of Congress in Washington, DC. Filled with excerpts from primary documents, including Jefferson’s thoughts on books, reading, and learning, this title also features John O’Brien’s whimsical and detailed illustrations. Rosenstock and O’Brien worked closely with experts to ensure the text and images are accurate. The book concludes with an author’s note, bibliography, and source notes. Last year I read, Barb Rosenstock’s The Camping Trip that Changed America. This was my first introduction to Rosenstock’s work, and I really enjoyed the book. I was excited to see that she had a new one out, and pulled if off of the new release wall at Vroman’s. I don’t think I had read more than a couple of pages when I knew that this was one that I had to have. A few days later, I attended a book group of about 20+ teachers and librarians who book talk their latest book finds. Guess which book I brought with me? If you said Thomas Jefferson Builds a Library, you would be 100% correct. What made me like this book as much as I did? Page 6. Well, yes, I did love page six and it is in the book trailer. Hint: What word did Jefferson spell out? But, let me be serious for a minute. Rosenstock fully captures Thomas Jefferson’s love for books. Jefferson loved to read nearly above all else. Jefferson loved books so much that he began collecting them. On his first trip to Europe, Jefferson shopped for books. “Tom bought two thousand books in five years, more than a book a day.” That is some serious book shopping. Still, there is more to love about this book. Did you know that Jefferson had his own system for organizing books? Did you know that while president, Jefferson tripled the number of books in the Library of Congress? And after the Library of Congress experienced a fire that burned through 3,000 books, Jefferson donated his personal collection to the Library of Congress. Though this book is focused on specific events in Jefferson’s life as they related to books, the foucs is a good one that works. The book does include an author’s note and other tidbits of information and various resources at the end. I encourage you to read through them. Also, Rosenstock’s text provides readers with information for further research on Jefferson and the Library of Congress. Readers are invited to read through the book using the main text to inform and inspire them. However, readers can read the book for a second or third time, as they look through the illustrations and read all of the small text boxes. Rosenstock’s Thomas Jefferson Builds a Library would make a nice addition to any classroom or school library. Look for this book at your public library or pick up a copy at your local independent bookstore. It’s never too early for kids to get acquainted with history—to have aha! moments as they identify role models and make important connections. The picture books featured here serve up factual information in story form and provide great introductions to significant figures from America’s past. 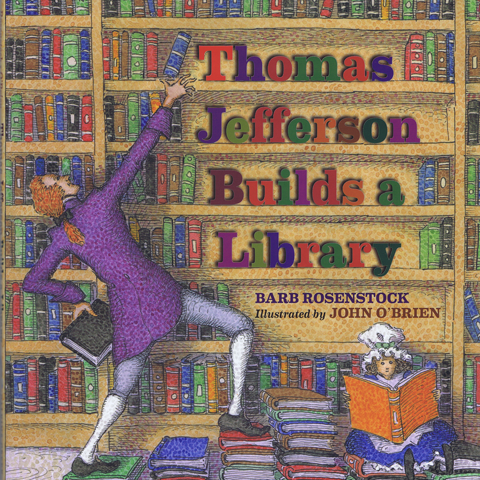 Barb Rosenstock’s Thomas Jefferson Builds a Library (ages 8 to 11) is a lighthearted profile of our third president—a statesman with a serious book fixation. Born in Shadwell, Virginia, in 1743, Tom Jefferson grows up with a love for books, a passion that serves him well as he enters politics. Through the years, he collects thousands of titles on all sorts of subjects. His wife, Martha, is a kindred spirit, and together, they instill a love of reading in their children. John O’Brien’s jolly, rollicking pen-and-ink illustrations show the great man reading in the unlikeliest of places (while balancing on the bowsprit of a ship, for instance). Teeming shelves and precariously stacked piles deliver a sense of the density of Tom’s personal collection, the vast size of which enables him to resupply the Library of Congress after the British burn it in 1814. Rosenstock, who knows how to make facts fun, has written a spirited story that stands as testament to the impact of books. This is a biography that young readers will learn from and enjoy—at the same time!